The DUNVPJT full motion universal ceiling mount saves valuable wall and floor space by suspending your digital projector from the ceiling. Ideal for home theaters, classrooms, boardrooms, hotels, bars and restaurants, the DUNVPJT fits most projector brands.An integrated ball-joint design allows easy customization of your viewing at any time. A 360° swivel and -20° to +20° tilt capability provides comfortable viewing from multiple angles. The easy-grip adjustment knob holds the image position with no sag or drift. A quick-release connector allows easy removal of the projector for cleaning or light bulb replacement and reinstallation with no realignment necessary.The durable all-metal unit supports up to 25 kg (55 lbs.). The scratch-resistant powder-coated finish tolerates frequent handling and blends with any décor. Installation hardware is included. The DUNVPJT's base plate and four adjustable support arms conform to hole patterns located on the housing of most projectors. 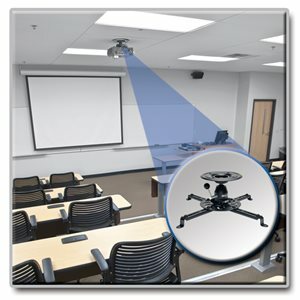 Tripp Lite’s VESA-compliant DUNVPJT Universal Projector Mount frees up valuable wall and floor space by enabling the suspension of a digital projector from a ceiling. With a universal design that fits most projector brands and supports weights of up to 55 lb., the DUNVPJT is perfect for home theaters, classrooms, boardrooms, hotels, bars, restaurants or anywhere a projector needs to be mounted. The DUNVPJT adjusts to optimize viewing angles and makes the most of your display environment. An integrated ball joint design allows 360-degree full-motion rotation and 20-degree tilt for multi-angle viewing. Adjustments are simple with the easy grip knob that holds the image position without any sag or drift. The DUNVPJT comes with all the hardware you need for installation. Forget about having to take down a projector to change its lightbulb or clean the unit, only to painstakingly reconfigure its picture position. For simplified maintenance, the DUNVPJT’s quick release connector allows the projector to be re-installed quickly and easily without re-alignment. The DUNVPJT’s durable, all-metal frame with scratch-resistant, powder-coat finish withstands the stress of repeated use and blends easily into any décor. VESA (Video Electronics Standards Association) is a professional organization whose purpose is to promote uniformity in the video electronics industry by developing industry-wide interface standards for a wide variety of audio/video products. The DUNVPJT’s base plate is guaranteed to work with a variety of VESA-compliant patterns located on the projector’s housing. To ensure that the DUNVPJT supports your projector make and model, first refer to your device’s owner’s manual. The DUNVPJT is manufactured in compliance with strict RoHS specifications, reflecting Tripp Lite’s commitment to environmental responsibility. For peace of mind, it comes backed by a 5-year warranty. Supports weights up to 55 lb.